File box holds up to twenty 1/2" thick hanging folders that accommodate letter-size documents. Carry handle flips down for easy storage. Secure with single-latch closure. File box is made of durable high-impact plastic. 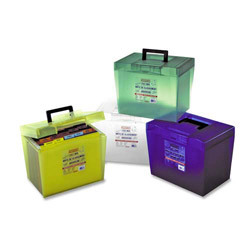 Assorted Filing Boxes from TOPS! 43 In Stock today.